Christmas came very early in the form of a cheque and gold medal presented to the practice for our Carnegie Library and Galleries in Dunfermline by Fiona Hyslop MSP, the Secretary for Culture, Tourism and External Affairs. This was the fourth time the practice have been shortlisted but the first time we have won the award. Richard Murphy said “We are thrilled that Dunfermline Carnegie Library and Galleries has won the Andrew Doolan Award 2017 - it represents the culmination of ten years of hard work since the original design competition was won in 2006. It's also an award recognising Fife Council’s dogged persistence with their vision for the building through the ups and downs of the development of the building; a fact itself recognised when they were given, earlier this year, the Client of the Year Award”. Richard Murphy Architects now holds concurrently “RIBA UK House of the Year Award”, “RIAI Irish Architecture Public Choice Award 2017”, and now “RIAS Andrew Doolan Best Building in Scotland Award 2017”, an architectural “Triple Crown”. The dramatic renovation and new facilities at Perth Theatre are now available to the public with the first performance “Aladdin” opening on December 9th. 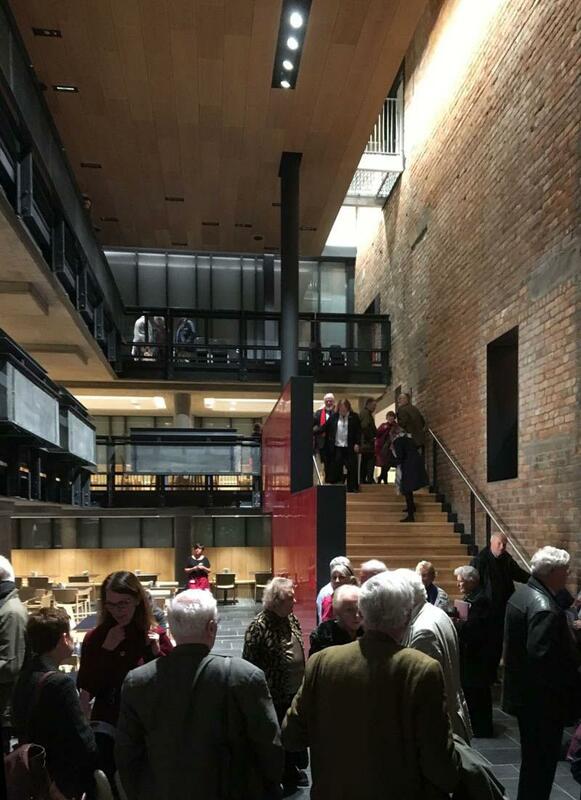 Members of the Arts Society Tayside each paid £10 for a preview and a chance to hear from Richard Murphy and Bill Black about the building when they shared the stage with Philip Long who talked about the forthcoming V&A Museum in Dundee. The project has demolished everything except the changing rooms and the historic Grade B listed auditorium which has been restored including bringing back into play the “God’s” gallery. Newly constructed are the foyer, bar, restaurant, a 200 seat flexible studio theatre (just this week named the “Joan Knight Studio“), rehearsal studio and offices. More news and photographs will be in the next newsletter. 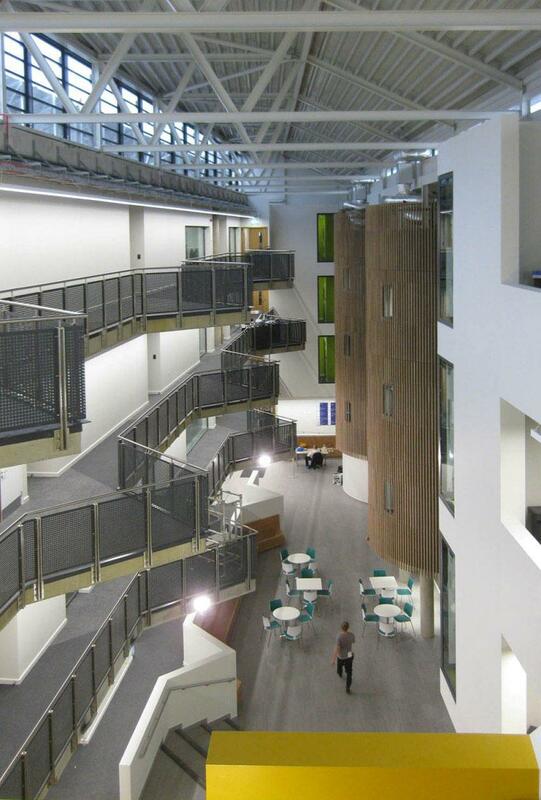 The contractor Morgan Sindall has officially handed over our new £20m Science Faculty Building to Anglia Ruskin University; students and staff will be using it in the New Year semester. Situated on the University’s East Road Campus it represents our second major facility completed for the University; the first, the Young Street satellite campus, won the “Cambridge Building of the Year” in 2016. 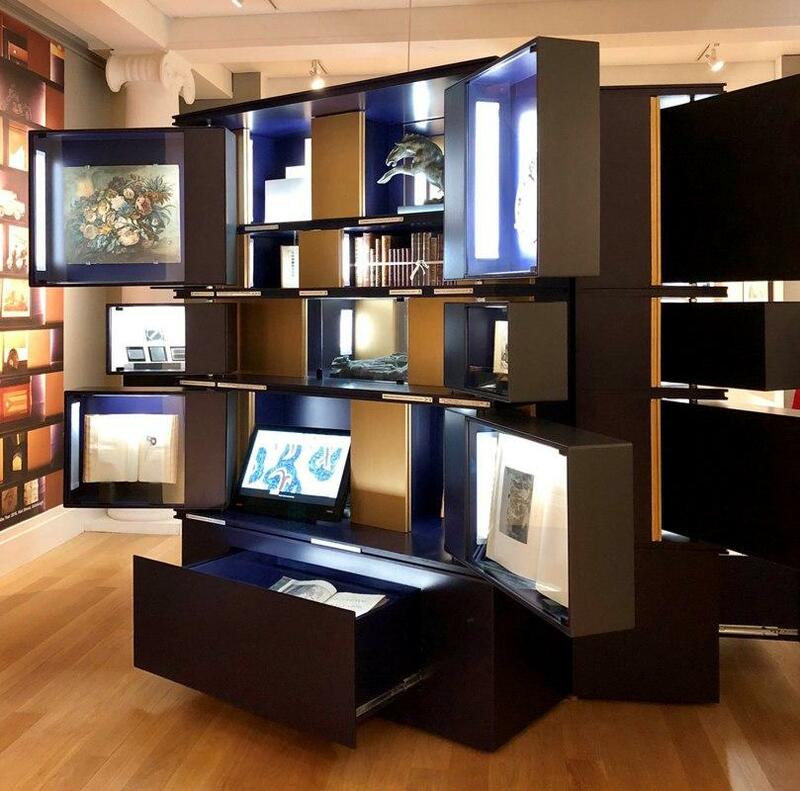 The remarkable exhibition currently running at the Royal Scottish Academy until 7th January 2018 features a cabinet of curiosities designed by the practice. It is a large triangular plan, each side containing six exhibition doors and drawers. In the use of mirrors and illusions it is inspired by Sir John Soane’s own house as first translated though Richard’s house in Hart Street. In the catalogue Sandy Wood writes “the challenge for Richard Murphy was to re-imagine the display of an entire room into a contraption that would take up just a quarter of the space. Fortunately Murphy is a master of the spatial sleight of hand and in true Soanian style has designed a mini-universe of mirrors, revealing spaces and intricate cubby holes that afford a delightful discovery of all types of object at every turn.” After the exhibition the cabinet will be reconfigured and placed along one wall of the President’s room as a permanent exhibit. On the 10th November, Richard attended our own Maggie's Centre 21st birthday party at Edinburgh Maggie's and marvelled that it was 21 years since the first Maggie's opened its doors. 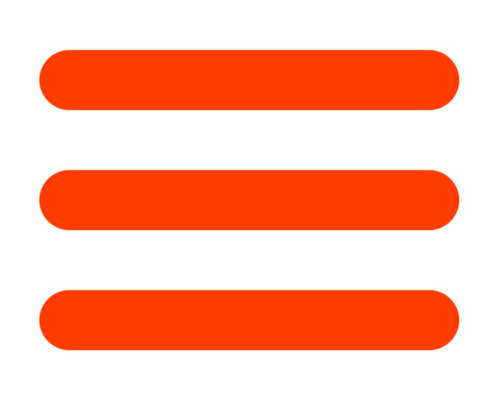 That tiny project has since grown to become a global phenomenon. The new extensions designed by the practice are about to start on site. 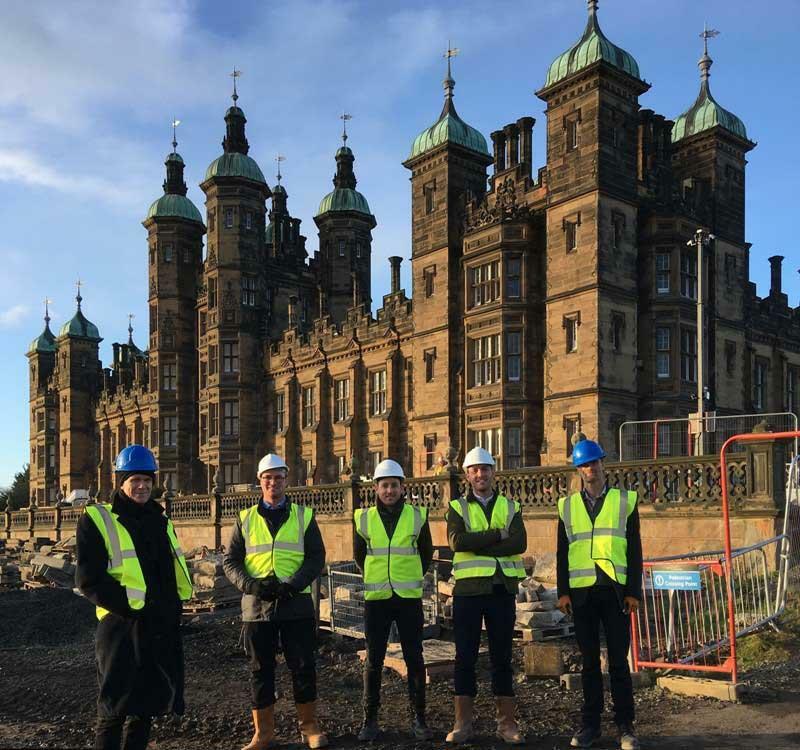 It is anticipated that the first show flat of the conversion of the Grade A listed Donaldson's School, Edinburgh by City and Country will be open to the public early in 2018. Pictured above are members of the office during a recent site visit. Steelwork erection is underway at the Cala Homes new build housing crescents at the former Donaldson's School in Edinburgh. The steel frame of the new £3.3m extension to our Galeri Creative Enterprise Centre, Caernarfon is almost complete. The project is due to be complete in summer next year and will provide the centre with two new cinemas and a new entrance. Exciting progress at the "secret" courtyard house at Tipperlinn Road in Morningside area of Edinburgh, the walls are starting to be lined with the electricians hard at work. The house is due for completion in early 2018. Internal finishes and landscaping are progressing at our house in Dalkey, Ireland. 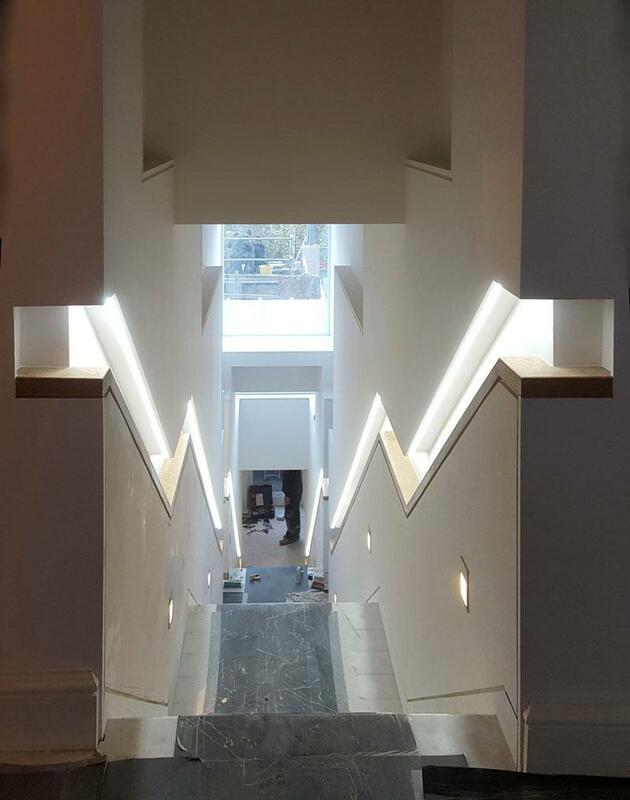 Our residential project in Moray Place is nearing completion which, along with alterations to the existing interior has added a new semi-basement master bedroom suite linked by this new internal cascading stair that connects all three levels, whilst also giving access out to the garden and new kitchen terrace. H M Raitt & Sons Ltd has been our contractor for a private client. Our two most recently completed buildings for the arts have featured prominently. The Dunfermline Carnegie Library & Galleries Doolan Prize was on both BBC and STV television news and reported extensively in The Scotsman, the Herald, the Dunfermline Press and Architect's Journal. The forthcoming opening of the theatre in Perth has featured in long articles in the Perth Courier, the Scotsman, the Scottish Daily Record and the Herald. Channel 4 has begun airing on Tuesday evenings this year's “RIBA House of the Year Award” competing houses. As last year’s winner Richard is a judge this year and he can be spotted wandering around the shortlisted houses. An interview with him is broadcast on the final programme on 28th November. Richard has been very busy lecturing about the work of the practice. In Galway he spoke twice at the “Architecture at the Edge” conference on the 29th and 30th September in our own building, the O’Donaghue Centre. On the 13th October he lectured to the whole school at the Mackintosh in Glasgow. This month he has already spoken at the Edinburgh Architectural Association on 1st November, on the 2nd he gave two lectures at Bournemouth Arts University and then the following day to the Inverness Chapter of the RIAS meeting in Dornoch. He and Bill Black talked on the 8th to the Tayside Arts club in the restored auditorium of Perth Theatre and the next evening James Mason talked to Business students at Edinburgh University about the financial running of an architectural practice. On a foreign lecture tour Richard is giving pairs of lectures on alternately the work of Scarpa at the Castelvecchio and the work of the practice: in Kuala Lumpur on the 14th and 15th November; in Melbourne on the 17th November; and in Brisbane on the 29th November. At the first of the foreign lectures in Kuala Lumpur 350 people came to hear Richard speak, but the hall had a capacity of 250 so a video link was set up to the outside. 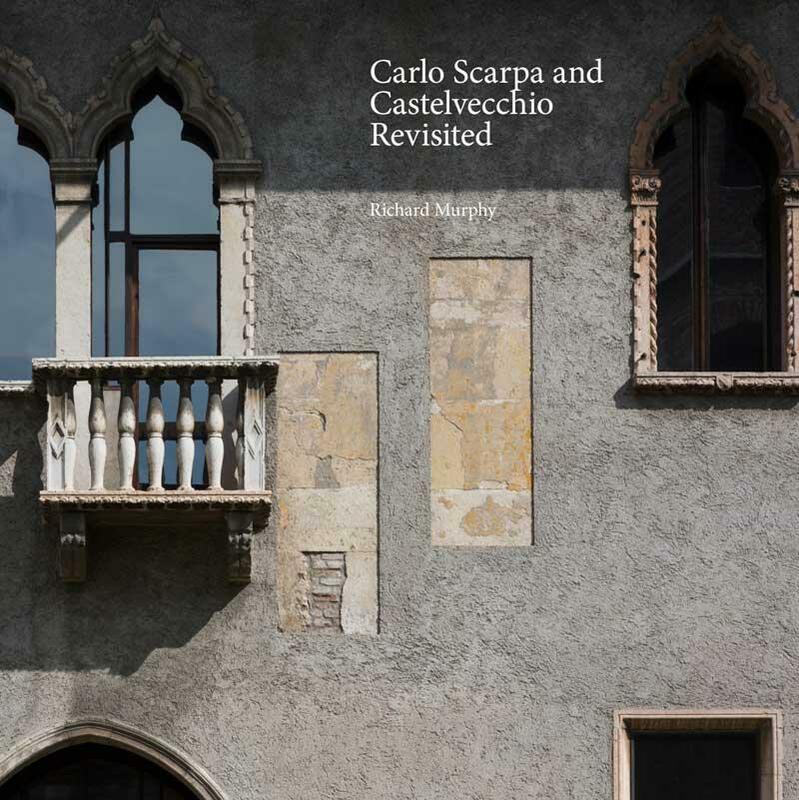 Richard Murphy’s new blockbuster book “Carlo Scarpa and Castelvecchio Revisited” has now been published. Copies can be purchased on line for £70 (including postage and packaging to anywhere in the world) by visiting this special website: www.breakfastmissionpublishing.com. In addition three special book launches are being held; 6th December in London at the RIBA Bookshop 17:30 - 19:30, two days later on the 8th December in Edinburgh at the Royal Scottish Academy 18:00 - 20:00 and on 19th December at the Verona Architects’ Association 17:00-19:00. If you would like an invitation to any of the events please contact Kathy Jowett in our office. Richard will be signing books on each occasion.